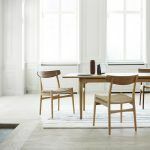 Presented for the first time at 1950, the CH23 chair features clean, organic contours and a refined style, demonstrating the unique style and insightful craftsmanship of the young Hans J. Wegner. Along with the CH24, it was once Carl Hansen's best-selling chair and also one of the most iconic. Details: Different oak and walnut finishes and two types of rope for the seat. 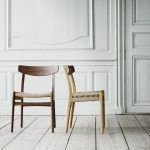 CH23 available in a mixed version, combining the structure in oak with the backrest in walnut. For more information on finishes and prices, contact Naharro furniture.